From the Hancock County Courthouse, go southeast on Hwy 15 for 2.3 miles to Shoal Rd which forks off to the left. Go on Shoal Rd for 1.8 miles to Road 62, which forks off to the right. Follow Road 62 for 0.4 mile to the St. Galilee cemetery and Maggie Reynolds Rd. on the left. Continue straight on Road 62. The path is 0.4 mile past the crossroads of Road 62 and Maggie Reynolds Rd. 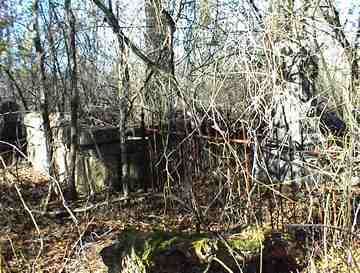 The rough path to the cemetery is on the right side of the road, behind a gate bar. Walk past the gate bar and follow the path west for 385 feet to the cemetery. Part of the cemetery is completely surrounded by a stone wall. Other parts are surrounded by fences. Still other parts are in the open. The graves with tombstones are of the Dickson family. There are also many unmarked graves which may be graves of slaves or other plantation workers. Graves 1-6 are within a wrought iron fence. "A few more toils, A few more tears, And we shall weep no more." On same monument as W. S. Dickson. Draped urn broken off from top and lying beside it. Birth day of 25 unreadable-taken from Muster Roll record. No service indicated on stone. On same monument as Rebecca Dickson. Draped urn broken off from top and lying beside it. per Muster Roll, Co K, 15th Regt GA Inf. "Thy memory shall ever be A guiding star to heaven." "To him we trust a place is given Among the saints with Christ in heaven." Given name per Mary Ann Willoughby -- only "J. M. Dickson" appears on gravestone. w/o J. M. Dickson. "Having finished life's duty, She now sweetly rests." Gravestone has hand holding cross with index finger pointing to right. "Her faithfulness in every duty will be remembered long after her body has returned to dust." Gravestone has hand holding cross with index finger pointing to the right. Fieldstone marker on a grave north of the granite wall. "Life's latest struggle cheerfully he passed, Unwearied still, Unflinching to the last." Is the only headstone within large granite walled area. Given name per family. Possibly as many as 5 more graves within the large granite walled area. "A light from our household is gone, A voice we loved is stilled, A place is vacant in our hearts, that never can be filled." Is outside of large granite walled area. Two unmarked graves near Julia Laughlin: one is the broken top of a gravestone, the other is marked with fieldstones. In a fenced area are mounded graves, some marked with brick or fieldstone headstones. Three of the graves are child-sized. Two are adult-sized. Room for 5 more graves. A few depressions and 3 fieldstones mark more graves in the open areas. 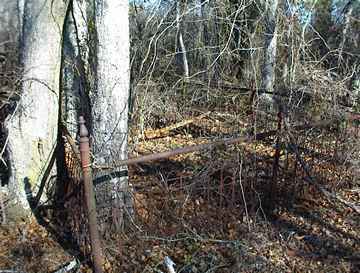 A fenced area of sufficient size for 4 graves. d. after 1937. James Nathaniel Dickson remembers site as being beside Greene L. Dickson's grave. Nathaniel Dickson remembers his funeral.